Daisy May has a home! 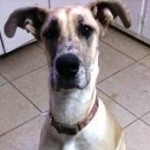 - Rocky Mountain Great Dane Rescue, Inc.
Daisy May has a home with Kevin in Centennial, CO. Kevin is a long time supporter of RMGDRI, and has adopted his last Dane Stella from us. Sadly she lost her battle to cancer recently and Kevin knew that Stella would want another Dane by Kevin’s side. Well, he has now filled the hole in his home and heart with sweet Daisy May! The two met and immediately had a connection. This sweet girl will never go without and will be spoiled rotten! She will share the home with a sweet 23 year old cat. Way to Go Daisy May!